There's something sad about Silsila (The Affair). In this film of adultery, love comes out on the bottom and martyrs on top. But that's to be expected, given the love quadrangles involved. The real twist of the knife in our emotions was Yash Chopra bookending the film with two versions of the same song. 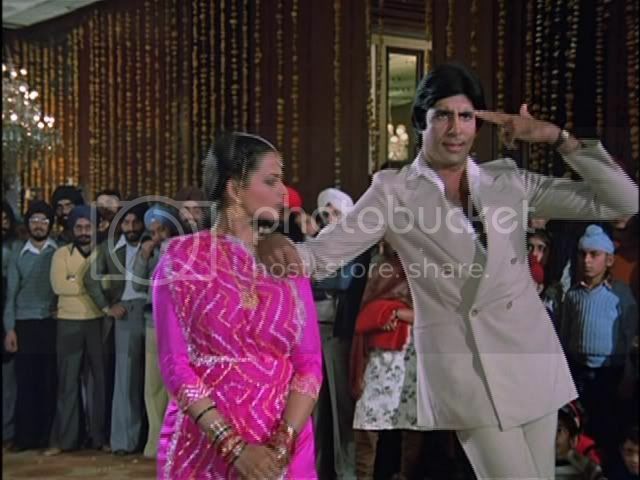 In the first version, Shekhar (Shashi Kapoor) and Shobha (Jaya Bachchan) sing each other's praises in the usual style, while many-colored maidens frolic around a soon-to-be-bride. The moment when Shashi comes in is, dare we say it, TRANSCENDENTAL. Yes, all is sublime. The weather, the strains of a minor key, the happy couple. Surely something is amiss, because happy couples don't exist in the early parts of Bollywood movies. And indeed, they are doomed. This song, Sar Se Sarke, has an evocative (we might even say soul-crushing) reprise in the end when, after all the fires and plane crashes and tears and destroyed lives, an emotionally exhausted Amit (Amitabh Bachchan), brother to the now-deceased Shekhar, sings it to his wife, Shobha (! ), in celebration of their sacrificial marriage. In Silsila, everyone gets hurt, the viewer included. The film opens with deceptive calm: Shekhar and Shobha are in love and intend to marry. Shekhar is a jet pilot (one of Chopra's favored occupations) who frequently flies dangerous missions into Kashmir, causing much anxiety to Shobha and Shashi Kapoor fans. Meanwhile, Shekhar's younger brother, Amit, is a poet who likes to go hiking in the Swiss mountains. One day at a party, he spots the beautiful and mysterious Chandni (Rekha), and they begin a suitably poetical courtship. They even find time to visit Holland! Yash Chopra trademark jet pilot? Check. Even more devastating is Shobha's news: she's pregnant. Since society would never accept pregnancy before marriage, Amit is put in the difficult position of putting his own life (and relationship with Chandni) on indefinite hold as he saves Shobha's honor and marries her. Chandni goes off and marries the likable Dr. Anand (Sanjeev Kumar), who's blithe and seemingly naive presence lifts many a dreary moment. But wait! It gets worse! One day, Amit and Shobha are driving and get in a serious-ish accident. Both end up in the hospital, in Dr. Anand's care (Requisite Bollywood Irony: check), and learn that Shobha has had a miscarriage. The mister and the missus. Thus Amit and Shobha are stuck in a loveless marriage whose whole purpose has proved ultimately futile. Yet while Shobha, as is often the case for filmi women, makes the best of the situation and begins to feel fondness for Amit, Amit retreats into his fantasies and, eventually, adulterous meetings with Chandni. Things become more and more tense in both homes, as Shobha and Dr. Anand begin to figure out that Something is Up. Coincidences and close calls, as per usual, abound. And at the Holi festivities, where Amit, high on bhang, performs an uncomfortably-explicit song to Chandni, even as their respective spouses look on, things start veering towards the inevitable, painful collision. The classic Holi song, now sung during the festival regardless of adulterous couples present. You're my wife. I'm your husband. And that's the truth. Everything else is a lie. Further breaks in the fourth wall occur during the songs. Rang Barse (see above) was based on a poem penned by Amitabh's father, the famed poet Harivansh Rai Bachchan, and sung by Amitabh himself. In terms of the performances, everyone has that appropriately dour, troubled look, with the notable exceptions of Shashi Kapoor and, to some extent, Sanjeev Kumar. Sanjeev Kumar stands out in his difficult role: he manages to infuse Dr. Anand with likability and well-hidden pathos. Similarly, Jaya is wonderful in her transformations from grief to love to suspicion. The pace drags at times, especially as we're treated to repetitions of earlier scenes (Amit and Chandni getting caught, feeling guilty, again and again) and a few too many songs, so we'd recommend taking advantage of that intermission to go and do other things, perhaps having a dance party or other bouncy event that can counteract the effects of SAD (Silsila Affected Depression). The Big B's soft around the middle. Shashi's very soft around the middle. The Big B is still wearing his underwear. In case you were too busy reading the ads. Top-notch comments on a so-so film. My best takeaway from *Silsila* is that it solidified my opinion that Sanjeev Kumar is one of the finest actors India has ever produced. He totally runs away with this film, with his pained, everyman countenance. I just love the scene toward the film's end, when he's heading off for that fateful business trip, saying goodbye to Rekha at the airport - you can just see in his face his fear of losing her, and it's so touching and sad. Love him! Another trivia note: *Silsila* is the first film for which Javed Akhtar wrote song lyrics, after writing a couple of dozen of scripts, mostly with Salim Khan. Your reviews are great - always looking forward to the next one. maybe it's because I haven't seen other movies with Rekah\Amitabh paired together, but I seriously think they are overrated! The movie was okay, it dragged on way too long in certain moments and way too fast in others **cough**the ending**cough. I really enjoyed Amit's line at the end about them being husband and wife and everything else being a lie, somehow it made me think that the past 3 hours of my life weren't wasted. Always good fun in PPCC! Liked this one also. Always good fun in PPCC. Liked this one also. This film could not have ended any other way, given how conservative India is on marriage (at the time anyway). But still, the songs were wonderful and the subject matter was explored very skilfully and with decent depth/respect given to the lovers within the marriage/affair.